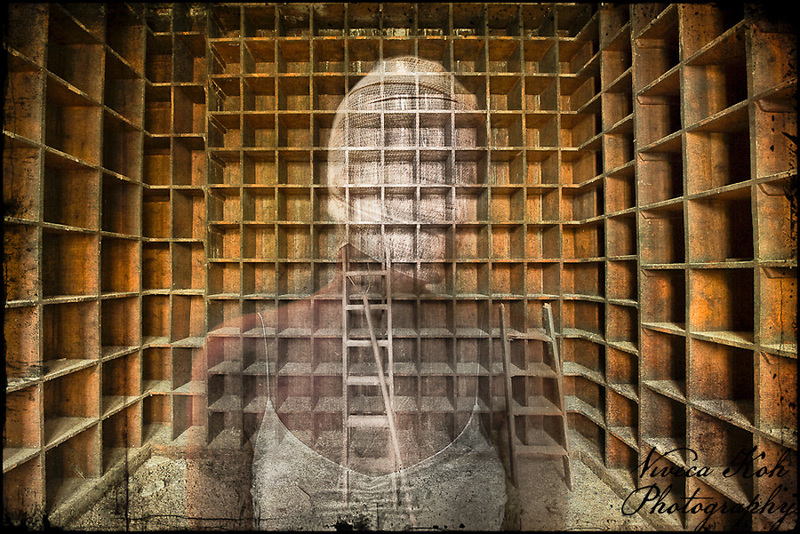 Trying something a little different here, in that I have taken a photo from the recent explore at the abandoned toolmakers in Sheffield and combined it with an older photograph of myself from the bandaged head series (used to create The Trick is to Keep Breathing). I was aiming for something vaguely disturbing and unsettling, with a surreal edge and a very illustrative feel, and am fairly happy with the end result, although towards the end of the work I found I couldn’t decide if it was finished or not. When this happens to my Mother (a landscape painter) she will put aside the painting for weeks, until she can look at it with fresh and more objective eyes, but I also remembered her advice not to overwork a piece, that there has to come a cut-off point when one decides to just stop and not ‘fiddle’. Made the decision at bed time last night that it was done, and here it is. This entry was posted on Wednesday, August 24th, 2011 at 15:36. It is filed under Lectures & Projects, Textured Photographs and tagged with abandoned, Artist, Digital Image Manipulation, Fine Art, portrait, self-portrait, texture, Textures, UE, Urban Exploration, UrbEx. You can follow any responses to this entry through the RSS 2.0 feed. Very interesting. It causes the viewer to think. Great job! Wow I think you’ve achieved what you set out to do. Excellent image. WOW Viveca, this is absolutely profound and insightful, for all of us! I just love your processing, it’s so absolutely perfect for the statement you’re making here. A wonderful and amazing picture that allows us all to look introspectively at the inner sanctums of our own minds! Top drawer my dear friend! For me it does seem surreal and illustrative, but not at all disturbing – there’s something else needed for that but I can’t quite put my finger on what it is…though perhaps it’s not one thing that would do so, and is more of a Room 101 situation that is unique to the individual. I can’t decide if I would like to see various parts of you less opaque or if it’s already perfect as it is. I guess you were the same when debating if it was complete or not. I really like the positioning of that central ladder leading up to your head, and overall I dig the image, it’s very much a welcome return of the bandaged head.